This is my view of the Battle of Bannockburn Visitor Centre, owned by the National Trust for Scotland. And I have to make it clear from the start I was fed canapes when I was there. And offered wine. It was a trade event. The staff were charming and helpful. The visitor attraction tells the story of what happened at the Battle of Bannockburn, near Stirling, in June of 1314. It was a vital clash in the Wars of Independence, and the Scots were the underdogs against the much-fancied English team. King Robert I ('The Bruce') works the room, along with his bitter enemy King Edward II of England. (Pictured here) Wait, isn’t that King Robert I of Scotland, impressing those two tourism professionals? And – no, it can’t be – yes, it is. It’s King Edward II of England himself, looking very pensive and slightly apprehensive. Well, from what I heard, he wasn’t too keen on chatting to, uhmm, the ladies. Nudge, wink. Now, the 700th anniversary of the battle that delivered Scotland’s independence for almost four centuries is also the same year that Scotland was given the chance to become independent again. So, you would think that the National Trust for Scotland would run for miles rather than be seen to be associated with all of the political and emotional ramifications of the idea of independence. I mean, the Scots’ King Robert won, didn’t he? You know, "proud Edward’s army" of England and all that. He “sent them homeward, to think again”, didn’t he? Well, they got round this problem of being seen as partisan with a very clever ploy. They simply treat the battle as a glorified computer game. Rather cleverly, the designers have avoided anything overtly favouring Scotland by interpreting the battle as some kind of computer game: a kind of make-believe, illusory, flashing, who-cares-who-wins entertainment. So, what do you get for your entrance fee (which some say is pretty steep if you are not a member of the NTS)? There is a shop selling Bannockburn themed stuff and other stuff as well. In fact, it’s got lots of stuff. After your browse, suitably batched and timed, you are taken into a kind of high-tech Punch-and-Judy show which gives some historical background, using animated figures. It’s all very clever - almost tongue in-cheek. 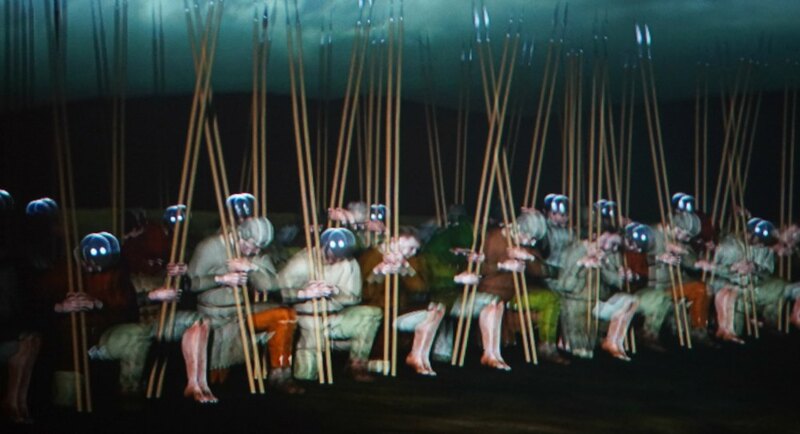 Battle of Bannockburn presentation without the 3-D glasses. (Pictured here) Take off your 3D glasses and suddenly the crepuscular (apparently) Battle of Bannockburn becomes fuzzy as well. I just want to say here that it isn’t easy photographing something that’s meant to be in 3D with those funny glasses. And, no, please don’t get the impression that the Scots won because King Robert had the bright idea of giving them all two parallel spears each, in order to double their chances of kebabbing an English foot soldier. It only looks like that because, obviously I couldn’t get the glasses to on the camera. It was also very dark and I kept bumping into other guests. I swear I reached out and put my hand straight through one of them. So maybe he was really an English archer and not actually there at all. I was glad I hadn’t been drinking at that point. Then you go into a circular room, with projection screens all around. You have to wear those weird 3D specs. That’s compulsory. And it’s very dark. Unless you knew the Battle of Bannockburn was fought in mid-June - the English army set out for Stirling from Edinburgh on the 22nd June to match the 30 or so miles to the battlefield - you would be forgiven for believing this was a twilight encounter. Maybe it was the glasses. Anyway, suddenly, there are arrows flashing across your nose, horsemen pounding into the room, swords clashing, soldiers yelling. It’s visual candy-floss. Very 3D and flashy. Quite impressive, really. And if it all gets a bit confusing or too much then you can go into a wee side corridor, wave your arms at, uhmm, some images of soldiery and they start talking to you. Actually, my powers of description are failing me here. 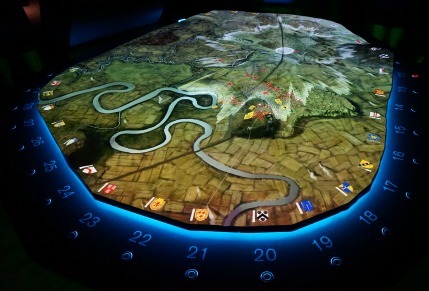 Battle Table, Bannockburn Heritage Centre, near Stirling. (Pictured here) The Battle table. You don’t get any impression of scale here but it’s, uhmm, like a big round table, only lumpier. The battle master stands, in costume, chain mail and leathery bits, at a console-thing and he/she invites the participants to move projected formations of archers and all the others around until he/she decides one side has won. I think. Heck, I’m supposed to be an expert on Scotland and I hadn’t a clue what was going on. Please don’t be judgmental. But wait, there’s more. You can take part in the battle yourself by taking sides at the ‘Battle Table’, where a battle master is in charge to orchestrate the whole thing. Maybe I just don’t get war games, but I took part, in company with other participants in a circle round the table. To be honest, by the time it was over, I was both sweaty and baffled, partly because nobody in those days had the advantage of looking down on a battlefield from the equivalent of, oh, about 1000 ft up in the sky above it. Nope. Mystified. I think the English won when I was there, just to make matters even more unsatisfactory. Distant view of Robert 'the Bruce', King of Scotland, and the Rotunda at the Bannockburn Heritage Centre. (Pictured here) Outside, Robert the Bruce sits distantly and grimly. Around him and his Rotunda, there is mown grass, a swathe of parkland that might, just might, have been part of the battlefield. He was photographed on a dreich, rainy evening and there were people outside walking their dogs and carrying poop-bags in the way that tries to give the impression these have nothing to do with them. It was the last little surreal touch. Thank you to the National Trust for Scotland for showing me your Bannockburn Visitor Centre. And you’d rather I was honest, wouldn't you? Especially as you have so many brilliantly authentic experiences of landscape and history elsewhere in Scotland. I’m just not sure that Bannockburn is one of them. More information about visiting, on the NTS's own dedicated Battle of Bannockburn website. Remember that if you want the full works, and aren't just going for say, a coffee in the restaurant or a wee look in the shop, then entry is by pre-booked time slots.